We have exactly what you need to relieve the pain and heal your injury quickly, so you can stay in the race. The medical devices below are designed to focus on healing you, so you can stay focused on training and competing. We have medical devices for nearly every part of the body, so no matter where your injury is located, we have something for you. 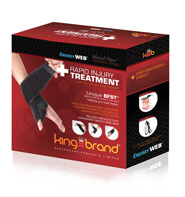 With King Brand Healthcare Products®, you can get your body back to peak performance and keep racing like a king. As a Cyclist, you know better than anyone how hard Cycling can be on the body. And you know that when you're injured, you don't want to have to take any time off from Cycling - you want to heal as quickly as possible and get back out there! That's why we designed a more proactive solution than just resting the injury. If you want to eliminate the pain and heal the injury fast, you need our BFST® and ColdCure® medical devices. Do a BFST® treatment before you train or compete, or before any type of physical activity. We recommend that you do 3-4 BFST® treatments per day. This will help you heal quickly. Do this and your Cycling injury can truly heal - finally. Use our ColdCure® and BFST® Wraps to heal your Cycling injury as quickly and completely as possible. Start with the ColdCure® Wrap first. ColdCure® treatments will relieve the pain and swelling of your injury. Do regular ColdCure® treatments throughout the day until your pain and swelling are under control. This will take 2-10 days depending on the severity of your condition. Once your pain and swelling is gone, you can start using the BFST® Wrap. BFST® treatments stimulate blood flow in the area of your injury to actively heal your damaged tissue. Treatments are simple and easy: plug the device in, turn it on and rest. It's important that you do a BFST® treatment before you race or do any exercise, as this will help prevent the risk of re-injury. The effects of each 20 minute BFST® treatment last for up to 4 hours, meaning that you're still receiving the healing benefits of optimum blood flow after your treatment has ended. Wear KB Support Tape during races and between BFST® and ColdCure® treatments to provide your tissue with extra support and protection. KB Support Tape is lightweight, breathable and comfortable enough to be worn all day without getting in the way or restricting your movement. Stop wasting your time on treatments that don't work or make your injury even worse than before. You can heal your Cycling injury with the right treatment. You need a treatment that will stimulate blood flow and promote healing. 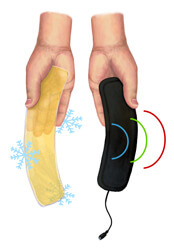 You need Blood Flow Stimulation Therapy® (BFST®). The BFST® Wrap stimulates blood flow through the injured area while you're at rest. This is very important because while at rest, an unaided and inflamed injury can otherwise have seriously impeded blood flow. It's the oxygen and nutrient-rich blood that enables the healing process, so adequate blood flow is required for your Cycling injury to heal as quickly as possible. Cycling injuries can be extremely painful and debilitating, causing you to reach for painkillers in order to find some relief. NSAIDs such as ASA, acetaminophen or ibuprofen are often used to treat the pain, but these drugs do nothing to treat the actual condition. In fact, NSAIDs are known blood thinners and make the bleeding worse for fresh tissue injuries. Typical pain medications actually interfere with the healing process. Cortisone injections are used in extreme cases but these too are intended to address the pain. They do not promote healing of the injury and they put you at a very high risk of further injury. 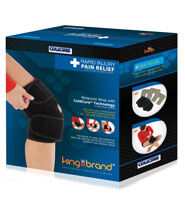 Use a ColdCure® Wrap from King Brand® and avoid the dangers of painkillers. ColdCure® Wraps are specifically designed to relieve the pain and inflammation associated with soft tissue injuries, including those sustained in Cycling. ColdCure® Wraps deliver soothing cold and comfortable compression without any of the negative aspects of painkillers. While painkillers take 20 minutes to kick in, the ColdCure® starts working as soon as you put it on. 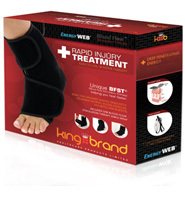 KB Support Tape provides compression to relieve your swelling throughout the day. 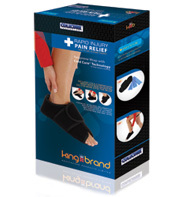 It also provides your injury with support and protection to prevent further tissue damage. It can be applied to any soft tissue injury you've sustained while Cycling. We used 2 different colors of KB Support Tape in the above image to better illustrate how the tape is applied for a Hamstring injury, just one of the many injuries that can be sustained during while Cycling. You do not need 2 different colors of KB Support Tape in order to achieve this application. While we found the above application to be effective for Hamstring injuries, it's only a suggestion. We encourage you to try different application methods for your given injury to find the one that works best for you. Also, remember to listen to what your body is telling you. If you feel the pain in a specific area of your leg (or other body part), apply the tape there. Keep doing BFST® treatments even after you think you've healed. The healing process takes much longer than most people realize. Even after you "feel better", your injury may only be 20% or 30% healed. If you want your injury to heal completely, you need to continue doing BFST® treatments for several months after the pain is gone. Do a BFST® treatment before any physical activity. This will act as a warm up for your circulatory system. 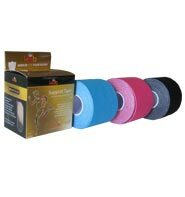 You should also continue taping your injury in order to prevent the risk of re-injury. Back and hip injuries are quite common in Cyclists. The back and hip injuries seen most often in Cyclists are Sciatica, Bulging Discs and Hip Labral Tears. These are usually a result of posture while Cycling. The BFST® and ColdCure® Back Wraps are extremely versatile and can be applied to any area of your back that's injured, including your lower back, mid-back, upper back and hips. If you have a back or hip issue, these are the products you need to relieve the pain and heal the damaged tissues. 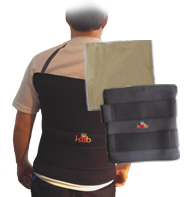 The Back Wraps are very easy to apply as they come with attached Velcro® straps that allow you to customize the fit. 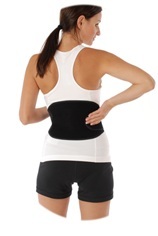 If your back injury requires mega coverage, we also have a ColdCure® Large Body Wrap. It has a massive treatment area of 16" x 16", so you can almost treat your entire back at one time! The coverage you get with the Large Body Wrap is huge. You can treat your lower, mid and upper back at the same time. More coverage means more cooling power and more relief. This Wrap is perfect for people who have multiple back issues or injuries that are too large to treat with a standard sized product. It comes with 2 extra large gel packs, so you can have one inside the wrap during your treatments while the other one charges in the freezer. This Wrap isn't designed for the back alone - you can use it to treat other areas of your body that are sore from Cycling. You can wrap your arms, legs, abdomen, etc! The top knee injuries that Cyclists sustain are IT Band Syndrome, knee ligament injuries (ACL, MCL & LCL) and Patellar Tendonitis. Knee injuries in Cyclists are most often caused by overuse. If you have a knee injury, our BFST® and ColdCure® Knee Wraps will work to control the pain and accelerate the healing process. 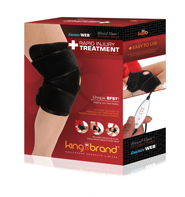 In order to target the exact area of your injury, the Knee Wraps unique U-shaped treatment area. This means they can be applied two different ways - with the treatment area covering the top of your kneecap and down the sides of your knee, or covering the bottom of your kneecap and up the sides of your knee. Wrist injuries in Cycling can be caused by gripping the handlebars tightly or from the vibrations that travel through the handlebars. These injuries include Carpal Tunnel Syndrome and de Quervain's Tenosynovitis. 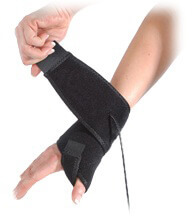 The BFST® and ColdCure® Wrist Wraps can be worn on the top and inside of your wrist, the top of your hand, the inside of your palm, or even further down your forearm. Just apply it to the area of your hand or wrist that's injured to target the painful area. 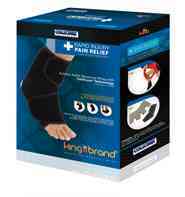 These are the products you need to stop the pain and speed the healing of your wrist or hand injury. The ColdCure® Wrap will help to control the pain and inflammation. The BFST® Wrap will bring additional blood flow to the damaged tissues in order to heal your injury. 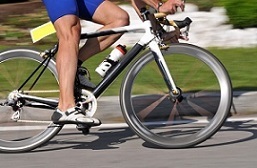 Hamstring and calf strains or tears are the top Leg injuries seen in Cyclists. These injuries are caused by overuse due to pedaling. The BFST® and ColdCure® Leg Wraps can be applied to any area of your leg, including your calf, thigh, shin or the back of your knee. They can actually be used on several different areas of the body because they're designed to be universal. If a leg injury is hindering your performance or stopping you from training altogether, these wraps can help. The ColdCure® Wrap uses cold and compression to bring down your swelling and relieve your pain, while the BFST® wrap promotes blood flow to heal your damaged tissues. You can't find this technology anywhere else. Plantar Fasciitis and Metatarsalgia are common in Cyclists because of the strain that pedaling puts on the feet. Achilles injuries, such as Achilles Tendonitis, can occur in Cyclists as a result of overuse. This overuse is directly related to pedaling. 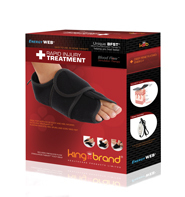 The BFST® and ColdCure® Achilles Wraps are custom designed to mold to the back of your ankle. They target the entire length of your Achilles Tendon, making them the ideal treatment for Achilles Tendonitis and other injuries located in the back of the ankle. This special design always ensures that you will receive an even distribution of energy or cooling power over the injury. 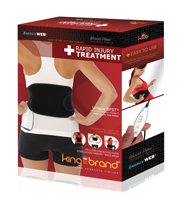 The ColdCure® Wrap will bring down your inflammation and relieve your pain. The BFST® Wrap will stimulate healthy blood flow in the area of your injury to help heal the damaged tissues. Every BFST® and ColdCure® Wrap purchased comes with the free professional consulting services of our King Brand® Advisors. This added benefit will be extremely helpful to you in terms of your treatments and overall recovery. Our Advisors are highly knowledgeable when it comes to treating a wide variety of Cycling-related injuries. They've also been extensively trained on BFST® and ColdCure® technology and treatments. One of our Advisors will contact you 2 or 3 days after your order has been delivered to ensure that you received your product(s) and to answer any questions you may have. Our Advisors truly care about your recovery, and they're here to help you every step of the way. They can even help you create a treatment plan that's specific to your injury and schedule. While one of our Advisors will follow up with you directly, you are welcome to contact us if you need any treatment advice or guidance. Combination Therapy means combining ColdCure® and BFST® by alternating treatments, as well as using KB Support Tape between your treatments. Combination Therapy is much more effective than using just one product or the other. This is because you're getting the pain and swelling relief of ColdCure®, the healing benefits of BFST®, as well as the protection and re-injury prevention of KB Support Tape, resulting in the absolute best treatment for your Cycling injury. ColdCure® Wraps are Class I FDA Registered medical devices. They're designed for use at home or on-the-go. They exceed all government and health agency regulatory requirements for cold therapy, specifically for use in treating soft tissue injuries like those sustained in Cycling. When applied, the ColdCure® Wrap immediately reduces the risk of further damage from excessive swelling. Doctors and Therapists agree that controlling swelling is a fundamental part of reducing long-term permanent damage resulting from soft tissue injuries. 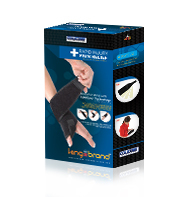 XC Gel® packs contain 10x more gel per lb than other products, for maximum coverage of your injury. Despite their size, our gel packs are never bulky. When stored in the freezer, our gel packs have 3x more cooling power per lb than other products. This means longer treatments for faster relief of pain and swelling. It also means less time spent getting up to swap out the packs. More coverage plus more cooling power means an overall better, more effective treatment. ColdCure® gel packs are specially designed for the shape of the body part you're treating. The wrap molds the cold pack around the injured area so you get an even distribution of cooling power every time. We don't just use one generic gel pack for all of our wraps. Every part of the body is uniquely shaped, which is why all of our gel packs are uniquely shaped too. These devices have 100% been designed to treat Cycling injuries. Note from KB WebMaster - The text below is primarily intended to assist with Google properly classifying this page content. To learn more about our products please visit our website.<br>Cycling injuries are seen throughout the body. The top back and hip injuries are Sciatica, Herniated Discs and Hip Labral Tears. The knee injuries seen most often in Cycling are IT Band Syndrome, knee ligament injuries and Patellar Tendonitis. The wrist injuries usually seen in Cycling are Carpal Tunnel Syndrome and De Quervain's Tenosynovitis. Leg Cycling injuries include Calf and thigh strains or tears. Cycling Foot injuries include Metatarsalgia and Plantar Fasciitis. Achilles Tendonitis is the most common ankle injury seen in Cyclists. Treat the pain of your cycling injuries with ColdCure. Treatment for your cycling injury will cause your pain to improve and your tendons, ligaments or muscles to heal. There's no doubt that to heal a cycling injury quickly, you need BFST treatments. ColdCure will help with pain and swelling. You can relieve cycling injury pain and a cycling injury with ColdCure and BFST technology. So, if you want to heal your cycling injury quickly, you need BFST. If you want to treat cycling injury pain you need ColdCure. Cycling injury symptoms are pain and inflammation. A cycling injury can be helped with exercises, although cycling injury exercises will not cure all cycling injuries. Some cycling injuries require surgery. This may heal the injury but the pain after surgery can be severe. The best cycling injury treatment is BFST. The best cycling injury pain treatment is ColdCure. These wraps are incredible. They feel comfortable. They work .